On the Road to Georgia, May, 2018. After two weeks of planning, we (Jenna and Josie) were itching to get on the road. 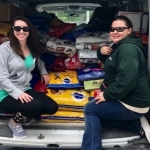 Our rented cargo van was filled to the brim with 2,000 pounds of donated dog and cat food. After leaving NEAS early Saturday morning, we headed south on I95. It felt good to know this was really happening – a 1,500 mile road trip that would take us through the back woods of West Virginia and then over the Appalachian mountains and on to rural Georgia. 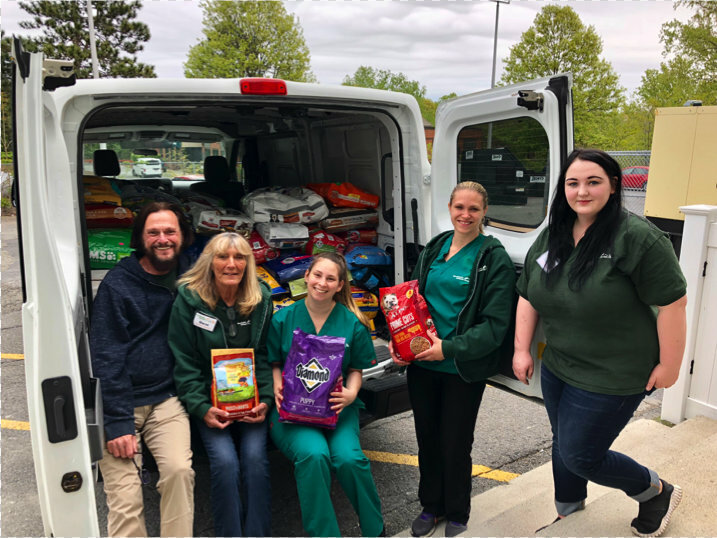 The purpose of our trip was to deliver food and supplies to rescue groups in other states who are partners with Northeast Animal Shelter (NEAS). We also brought along moolah (bank checks) to give to our partners. This was the money NEAS recently received as donations – gifts generously given just for this purpose – after we sent out an email appeal to NEAS’ supporters. We fantasized that we were driving Santa Claus’ sleigh in May! For years, sitting at our desks at NEAS, we always wondered how our rescue partners went about their mission. Where do our pets come from? How are they cared for before they are transported? And, most importantly, who are the guardian angels on the front lines helping to save the lives of so many homeless animals? Well, we were about to find out first hand. Our rescue partners are the first link in the life-saving chain of pet rescue. These partners are not shelters, with paid staff and buildings. 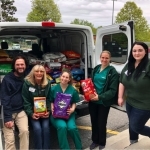 They are a community of unpaid volunteers who rescue homeless cats and dogs, take them home, and feed and care for them until they are ready to be transported to Salem. When it comes to kindheartedness and saving the lives of animals, our partners and their network of foster volunteers are among the best. Our first stop was Monroe County, WV. 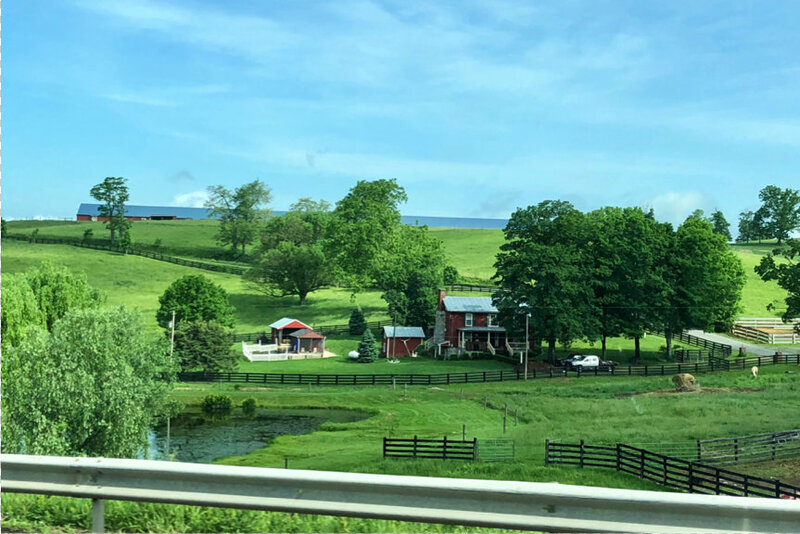 Here, among the picturesque valleys of the Appalachian Mountains and farms with last year’s rolls of hay in the pastures, we met up with Dina Wood, a Massachusetts native who now runs the Monroe County Animal League. 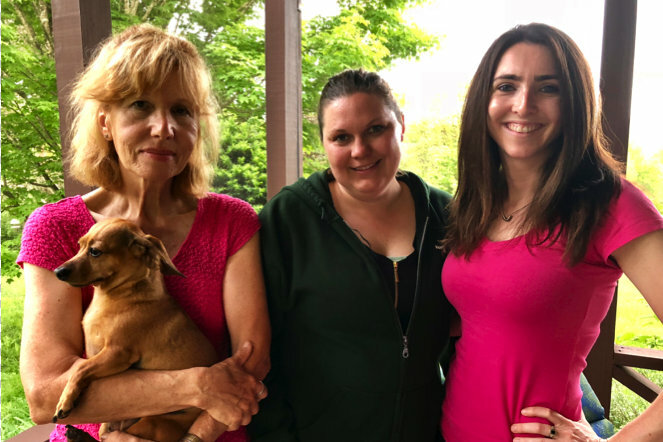 The name of Dina’s rescue group is impressive, and the work of her group is impressive, but the reality is that her organization is a small, compassionate bunch of Dina’s neighbors who simply love animals. Dina has been sending NEAS rescued pets since 1999, and each pet comes with a handwritten note describing what makes him or her special. As we got out of our van, Dina greeted us with the biggest smile. 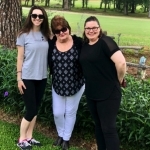 Dina invited us to stay at her home, and she had already invited her foster volunteers over to meet us. We listened to captivating pet rescue stories well into the night. We had the absolute pleasure of meeting Holly, the primary feline foster person of the group. Holly is very anxious to send some kittens and adult cats our way. Holly stressed how hard she tries to meet and to exceed our protocol requirements and how important this partnership is to her and the felines in their community. Sunday evening we heard lots of dogs barking, but over the din we couldn’t hear Dina yelling for help. We soon discovered the commotion was caused by two 6’ black snakes who had entered one of her dog pens. Dina, now quite the country girl, took it all in stride, but for us city slickers it was an event to remember. Before we departed, we gave Dina bags of pet food and a check. Everyone was genuinely surprised and so appreciative, telling us multiple times how much our donations would help, especially right now. 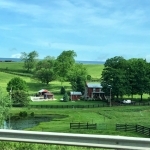 We then drove south, through twisty turns, over scenic hills, and along the New River valley in Virginia. In Aiken, SC, we were warmly greeted by the SPCA and the Friends of Aiken County, before moving on to Waynesboro, GA, where we looked for a cheap motel room. The Fairfield Inn seemed like a nice enough place to stay, but we balked at the $129 room rate. As we sat in the lobby calling around, the desk clerk finally showed sympathy and gave us a discounted price. Early Tuesday morning we met up with Margie Riggs. Margie is another long-time friend of NEAS and her rescue work is nothing short of incredible. She runs Old Fella Burke County Animal Rescue in a depressed rural area of Georgia where the median household income is $20,346 and 43% of the population are below the poverty line. It’s truly a sad situation. Margie introduced us to Angela, one of Old Fella’s foster care volunteers. 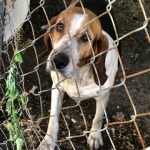 Angela does a lot more than just foster – she is Burke County’s only animal control officer for the entire 800-square-mile county, and she also runs the City of Waynesboro Animal Shelter. Angela and Margie work hand in hand to help as many pets as they possibly can. The next stop on our local tour was, as you might guess, the City of Waynesboro Animal Shelter. This is the only shelter in the county, and it is always filled. The shelter’s buildings would not seem out-of-place in a third-world country. One dilapidated building has 10 dog runs. Cats are housed in a shed, and more dogs are kept in a few outdoor pens. Some pens have make-shift tarps for shade, while other pens have no protection from the weather at all. One pen held ten puppies on a dirt floor because there are no funds in the county budget to pour a cement pad, or to even hire Angela someone to assist her. We decided that Angela is a real-life Superhero! She usually works single-handedly 7 days a week to keep the animals fed and cared for. It is remarkable that she can remain a pleasant person while having to face the challenges that she is up against each day. As we drove away, dark clouds gathered overhead and the skies opened up with a deluge of rain. Our thoughts went back to the puppies who would now be lying in pits of mud, further exposing them to the risk of disease. Margie told us that, whenever possible, she likes to rescue animals before they get to Angela’s under-funded and overcrowded shelter. 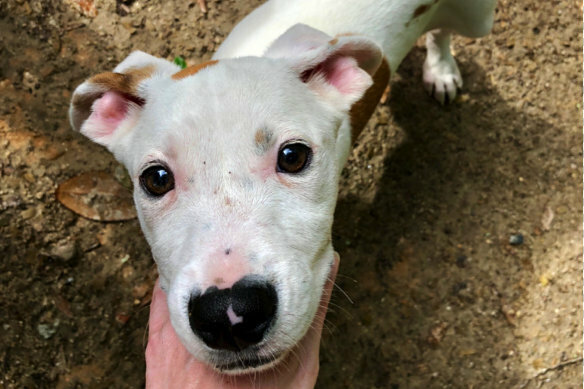 Neighbors bring Margie litters of newborn puppies, and she and her volunteers also pick up animals who are dropped of at community dumpster spots. Whoa! Did I say dumpsters? Margie took us to see what she was talking about. 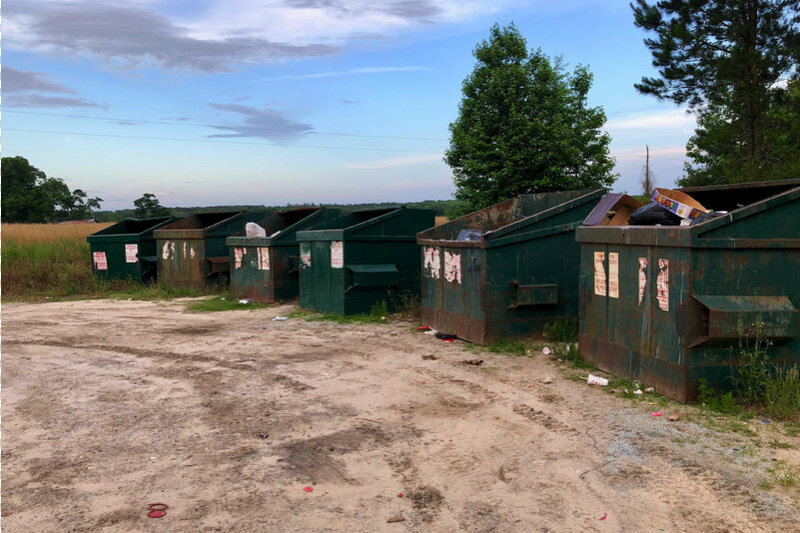 In this rural community, there isn’t a weekly garbage pickup for each home. 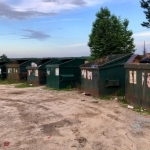 Instead, residents bring their trash to a central pickup point where the municipality has placed banks of dumpsters. It’s hard to believe, but along with the trash the local residents bring their unwanted animals. 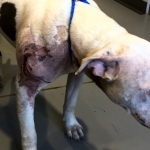 Animals are literally tied to dumpsters, or left in boxes, or sometimes even thrown into a dumpster. This is not an exaggeration. In this part of the country, this is a common practice and part of their culture. The prevailing attitude is that the plight of these animals is of little concern, and unwanted animals are often used for target practice. Margie told us that Old Fella’s partnership with NEAS is the only hope for these animals. 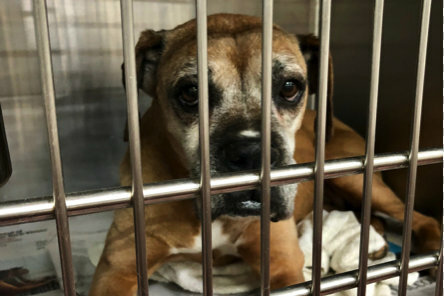 While we found their situation heartbreaking, there is no doubt that each pet Old Fella can send north means another pet can be saved. We ate lunch with over 20 Old Fella volunteers, fosters, supporters, the vet, her staff, Margie, Angela, etc. 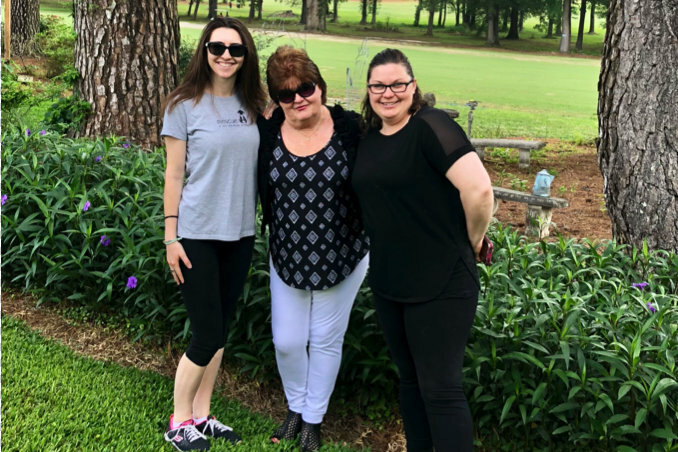 We felt so welcomed and special – like celebrities! We learned that “fostering” in Georgia is not at all what we expected. Pets are not taken into a home where they are given a soft bed and treated like part of the family. Rather, pets in foster care live in outdoor fenced-in pens, typically 10’ X 10’ with dirt or grass floors, sometimes cushioned with hay, and sometimes partially covered by a tarp for shade, and not much else. Margie’s network of fosters is currently caring for over 250 animals, and there is no room to take in more. Two of Margie’s foster dogs, Britta and Brayden, will be on the next transport to NEAS. Each will need leg amputations. Britta was snared in a hunter’s trap and chewed off part of her leg to get free, while Brayden lost his paw in an accident. They are the lucky ones. Margie says these days she can no longer stop at the community dumpsters. She has to look the other way and drive on by until the pets now in foster care are sent to NEAS. We decided it was appropriate for us to pick up the lunch bill (which was just shy of $200 including tip… thank you, rural Georgia!). After lunch, we visited 3 fosters (2 actual fosters and 1 woman who is caring for a litter of puppies that a stray dog brought to her when they came looking for food, not ideal but the only option as Margie’s fosters are all full). 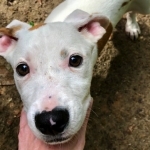 Margie gave the puppies vaccines from the tailgate of her pickup truck, and dewormers. We ended the day by unloading a good portion of the food and presenting Margie with a check, which brought her to happy tears. She was so overwhelmed and appreciative and a pleasure to spend the day with. After leaving Waynesboro, we headed west along the Fall Line Freeway to Macon, in central GA. Having delivered a good portion of our pet food, we filled up with gas for the umpteenth time (this van was truly a gas hog), but now it was beginning to feel like a sports car … Well, not really, but after giving away most of our load, the van was getting considerably lighter, and we had finally gotten used to driving it. We sped by vast stretches of dense forest, with stands of bald cypress and ash trees. During the two-hour drive we had time to reflect on what we had just seen. Our emotions were all over the place, happy that we had helped, and sad that we couldn’t help more. 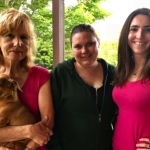 In Macon, we met up with our rescue partner Kerri Hatcher Fickling, founder of SOS Pet Rescue. Kerri is a Massachusetts native and a former financial analyst for IBM. She is now a working mom, and in 2013 she realized her true passion was to save unwanted animals from certain death. 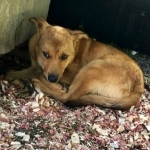 When she moved to Georgia, Kerri observed that her new state had a problem with unwanted animals. Thousands of cats and dogs were routinely euthanized in local animal shelters because no one altered their pets. She decided she had to do something, and used her own money to spay and neuter local cats and dogs. 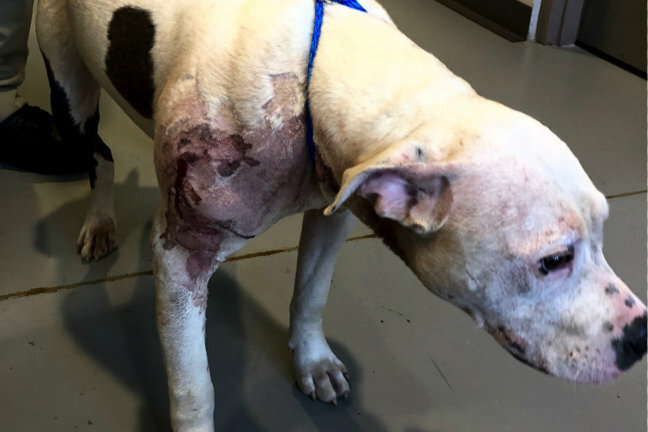 She even knocked on doors to offer low-income pet owners the opportunity to have their pets altered, only to find that many pet owners like their pets just the way they are. Today her rescue efforts have taken over her life. 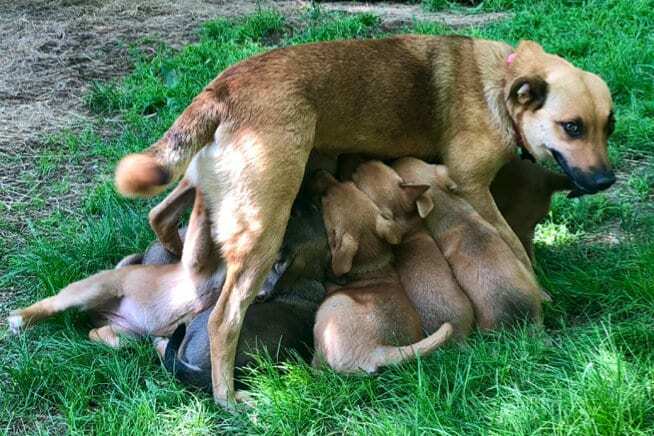 She sometimes fosters 20 animals in her own home, in spite of complaints from neighbors who have come to regard her as a force to be reckoned with! Kerri has a well-earned reputation for getting things done. She knows everyone and everyone knows her. The animals and community are beyond lucky to have her. She took us to see one rescue, All About Animals, where she sometimes pulls from. Then we went to the Macon-Bibb County Shelter, which is one of Kerri’s primary sources of animals. The newly appointed director, Tracey, gave us a full tour. She was very informative and is clearly passionate about what she does. The shelter is huge, new, and filled with countless animals, cats with litters of kittens of all ages, mother dogs with litters of young puppies, cruelty cases, etc. All the doors are labeled, including the “Euth Room.” Regardless of this conscience-assuaging acronym, the sign was a powerful reminder about the reality of euthanasia. We met a 5-week-old kitten with a severe URI that Tracey said she planned to euthanize before leaving for the day so that others wouldn’t get sick. Instead, Kerri called her cat person who came to get the little bugger. Luckily we stopped by! 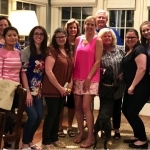 We were invited to Kerri’s home for snacks and to meet her awesome fosters. The conversations were wonderful. 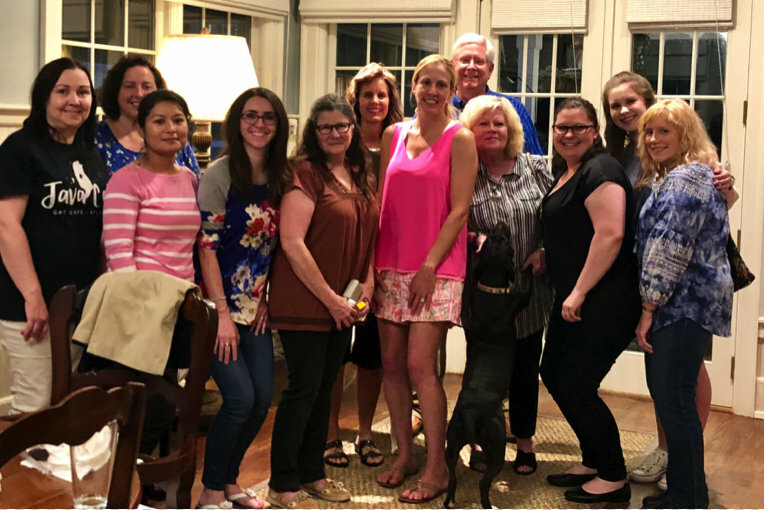 We learned that Kerri provides her foster homes with nothing but the best – she just bought them all new pens with attached dog houses that will go on paver stones. The dogs and puppies all eat top-of-the-line food, only one brand that she prefers. 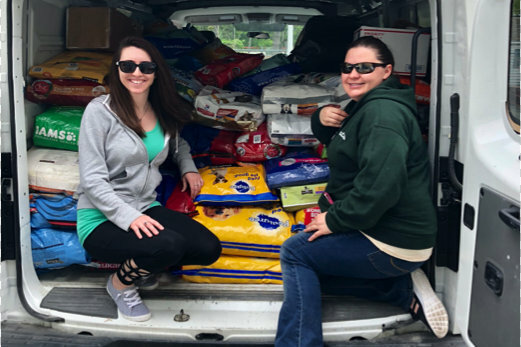 After leaving Macon, it was time to drive 80 miles to the Atlanta airport, where we would drop off our rented van, but we still had plenty of time, and some food to donate too, so we decided to visit 6 other shelters along the way. It is difficult to describe the depressing conditions of some of these shelters, particularly when our experience is working at NEAS’ modern, clean and safe facility. Most of the shelters we chose for our unscheduled visit were in rural areas, hidden away from view, down long unpaved roads. We gave away the last of our food to the first two of these shelters, who desperately needed it, and the staff was beyond appreciative. At another shelter, an armed guard escorted us in, and we soon learned why. The shelter was staffed by prison inmates, and it was not a loving place. Per the local animal control regulations, pets could not be touched by humans! They had to be moved around by snaring them with a loop attached to a long pole. Many of these pets are unlikely to ever leave this facility alive. Our last stop was the Fulton County Animal Control shelter, where 350 dogs were all housed inside a warehouse, separated by chain-link pens. 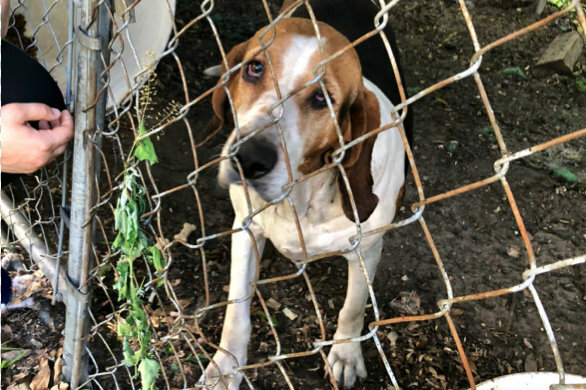 The racket was pretty hard on the ears, and the number of unwanted dogs was staggering, but we held out hope that some of these animals might be adopted. On the flight back, we gathered our thoughts. 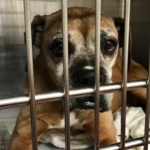 Since 1976, NEAS has saved more than 133,000 dogs and cats, but thousands more perish every day because there isn’t a safety net there to catch them. Our trip was an eye-opening, heart-wrenching, and emotionally draining experience, but oh so valuable! We are truly a part of a multi-state community, where every animal’s life is precious. 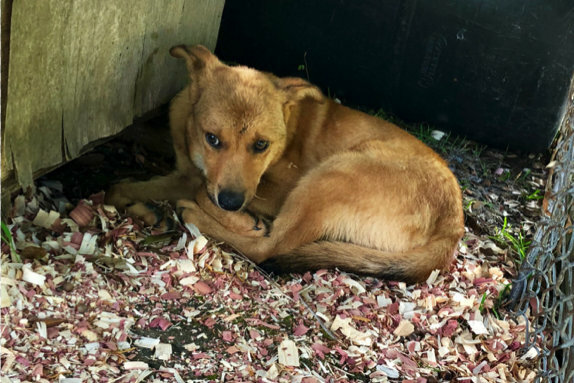 For animal rescue advocates who rely on NEAS for placing these pets in permanent homes, they should know that we will not become complacent about the urgency of our mission. We wake up every day knowing that we are making a difference. Jenna Bradley is the Adoptions Manager at the Northeast Animal Shelter in Salem. Josie Waldron is the shelter’s Transport Coordinator.